Basic Income Studies (BIS) is the first peer-reviewed journal devoted to basic income and related issues of poverty relief and universal welfare. An exciting venture supported by a major international network of scholars, policymakers, and activists, Basic Income Studies is the only forum dedicated to scholarly research on this leading edge movement in contemporary social policy. Articles discuss the design and implementation of basic income schemes, and address the theory and practice of universal welfare in clear, non-technical language that engages the wider policy community. The journal’s editors represent the forefront of research in poverty, political theory, welfare reform, ethics, and public finance, at institutions such as the University of Montreal, Georgetown University-Qatar, Université Catholique de Louvain, Australian National University, Stockholm University, National University of La Plata, University of York, University of Hamburg, Columbia University, Universitat de Barcelona, and the Hebrew University of Jerusalem. BIS was initiated by the Spanish basic income network, Red Renta Básica (RRB), the Spanish Instituto de Estudios Fiscales (IEF), and the Basic Income Earth Network (BIEN), and supported by the U.S. Basic Income Guarantee Network (USBIG). BIS gratefully acknowledges the support of these organizations. A basic income is a periodic cash payment unconditionally delivered to all on an individual basis, without means-test or work requirement. Academic discussion of basic income and related policies has been growing in the fields of economics, philosophy, political science, sociology, and public policy over the last few decades — with dozens of journal articles published each year, and basic income constituting the subject of more than 30 books in the last 10 years. In addition, the political discussion of basic income has been expanding through social organizations, NGOs and other advocacy groups. Internationally, recent years have witnessed the endorsement of basic income by grassroots movements as well as government officials in developing countries such as Brazil and South Africa. As the community of people working on this issue has been expanding all over the world, incorporating grassroots activists, high profile academics — including several Nobel Prize winners in economics — and policymakers, the amount of high quality research on this topic has increased considerably. In the light of such extensive scholarship on this topic, the need to coordinate research efforts through a journal specifically devoted to basic income and cognate policies became pressing. 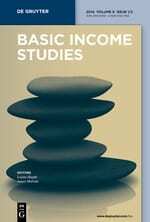 Basic Income Studies is the first academic journal to focus specifically on basic income and cognate policies. BIS publishes peer-reviewed research papers, book reviews, and short accessible commentaries that discuss a central aspect of the debate on basic income and related schemes. Contributions to BIS will typically discuss the empirical or normative analysis of basic income but may also include articles on related policies such as citizens’ pensions, stakeholder and sabbatical grants, negative income tax or earned income tax credits, and various job guarantee policies. Articles that discuss the state of modern welfare regimes or aspects of social security or employment regulation in more general terms will be considered provided there are clear implications for basic income research. Although BIS places considerable emphasis on rigorous conceptual development and/or thorough empirical analysis, all articles must be written in clear, non-technical language to ensure that they are accessible to non-specialists. BIS encourages publication both by established scholars and by researchers at the beginning of their careers. BIS has an international scope, aims to publish original articles and review essays on basic income in all countries, and strongly welcomes papers from non-Western countries. Basic Income Studies awards an annual essay prize for the best academic essay on basic income in the preceding year submitted for the prize. The deadline for nominations for the BIS Essay Prize is September 28, beginning with the 2018 prize. Papers to be considered for the BIS Essay Prize can be nominated by a recognized group or organization hosting an academic conference at which papers on basic income are presented. Recognition by the editors of BIS is a precondition for nomination of papers. Congresses of the Basic Income Earth Network (BIEN) and the North American Basic Income Guarantee Congress (NABIG) are automatically recognized, and papers presented at these congresses should be submitted by the authors by the deadline. Organizers of other conferences and panels* should request recognition from the BIS editors before the deadline. Submission: Send essays by email in Word or PDF format to mhoward@maine.edu, with “BIS Essay Prize 2018” in the subject heading. For the purpose of determining eligibility, indicate in the body of your email at which conference your paper was presented. A panel of judges chosen by the editors of BIS will choose the best English language essay from authorized submissions received by the deadline. *A recognized group (other than BIEN or NABIG) representing a conference focused on basic income may nominate up to 5 papers. A recognized coordinator for a panel on basic income at a conference may nominate one paper from the panel. In recognizing a group, BIS editors may require involvement in the nomination process by one or more members of the BIS editorial board.